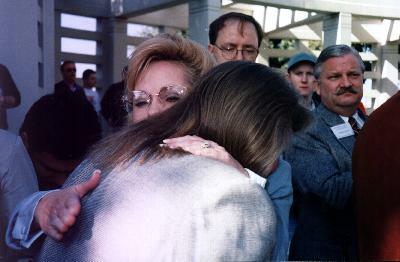 Kerry McCarthy speaks at JFK Lancer "November in Dallas" conference, 11/22/1997. To her immediate left is JFK Lancer's Debra Conway and Tom Jones. To Kerry's right is Mary Ferrell. To some of you it has been a beginning to find John Kennedy. To others it is thought of as his last moments here. But obviously he is destined not to leave us for many, many years. Especially while we still wonder who took him from us. I offer the respect that is so richly deserved to those of you in the research community and to all of my fellow speakers who have made the effort this weekend to remind us that a crime took place. To say to the conference attendees that I think you join me in thanking all of these people would be an understatement, for I see in your faces and in your demeanor a true belief that someday you will be a part of the solving of a crime referred too often to as the "crime of the century." Perhaps what is truly is the crime of the century is that Jack Kennedy was taken from us, and our world became more crime- ridden. Perhaps his death led us to care less in our own lifetime. And in that respect his death has diminished each of us as well as this country. 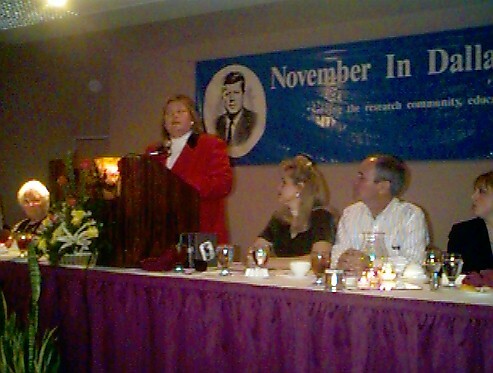 Now having made my sincere appreciation known to all of you, I must say that I wrote this speech before I noticed that Debra had put my picture from being seven years old in your program … dressed in Halloween costume holding a JFK poster. Had I known, I probably would not have thanked Debra so profusely this evening for her efforts. But it is an indication of the involvement that my life has had in being a Kennedy. From the time that I could speak I was taught how to say, "Vote for my Cousin!" It didn't matter which cousin - we always had one running. And we continue that trend today, although there are some that I would not probably ask for your vote for at this point. Because we seem to be taking over the horizon of politics. And tonight - although we are here to talk about a serious topic - I do ask that those of you that have shown your interest in this particular situation will also encourage the young people in your family to seek office. No matter what party. No matter what feeling you have. Because we will never solve the problem of a government that has not been honest with us - unless we replace the government in existence. Debra has asked me to speak to you about the "man" Jack Kennedy. Not the loss of him. And I am delighted to do so and it is a pleasure for me. For although his murder happened when I was young, he had already made an impression on me. Our lives revolved around the phone calls, the note and the letters that came from the White House. And the constant TV broadcasts where my cousin's smiling face, or sometimes his severe face, would appear on our TV screens. Now one thing that I must note is that Cousin Jack's news coverage never interrupted Roy Rogers or Captain Kangaroo, which were my favorite programs at the time. And luckily he never spoke during Dr. Kildare or a Beatles performance, for that could have been a serious conflict in the world of a seven-year-old. The Jack Kennedy that I know - from those images, from those quick glimpses of him, from him tussling the hair of those of us younger in the family, is the Jack Kennedy that I hoped would be with me in the years that I now enjoy. For Jack Kennedy was an inheritant that we and my family were robbed of. We are a generation ill at ease with ourselves. Unsure of ourselves. And we represent a country of people my age that have been lost since he was taken from us. In admitting that, one has to admit that indeed his loss was important enough to change the life and the history of a nation. That is a very heavy statement, and one that would have made Jack Kennedy himself very nervous. The delight that he brought to us was through his wit. In the family, it was his teasing ways. No brother could date a girl without Jack mentioning her attributes or her demeanor or her figure. No brother would date a girl without already having his arguments ready to present to Jack. He was a man who delighted in life only because he lived so close with death. To those who took him away - they could not have every truly understood that death was not a punishment to him - life was a reward that he never expected to have. For over three decades now, the family has asked that Jack be remembered on his birthday, May 29. And in Boston, often we gather in large numbers to do just that: to celebrate his life, and that is fine - for his life deserves to be remembered. But it would be impossible for this country to forget November 22, 1963 and what must be remembered by those who are not with us today is that President Kennedy's death demands reflection as well as his life does. For those of you that gather on this date you honor him as much as those that choose May as the date to honor him. It is fitting that we gather in Dallas this weekend, for it is in Dallas that he will ever be associated. The majority of you in this audience are of the research community, and in your work, in some cases your life's work, I understand. This assassination work has become a tribute, in effect, to his life - and I am keenly aware of that. He loved history and he loved literature. And you, too, through your work, I feel sure we would have his appreciation for the research that you do to bring history into focus and to present that history into factual terms. If Jack Kennedy had not have gone into politics he would have remained a writer. He would have continued a career in literature. And to see those of you publishing your ideas and your thoughts and your theories in an event such as this I think is a fine tribute to a man who inspired people to think - but a man who worshiped ideas. His own Profiles In Courage told us of people who got into positions who were scared - the most remarkable thing they did was to not quit. And I urge you tonight: Do not quit in the work that you do. For we need you. There is destined to be doubt in America. And even if the truth is ever told - from the animation and the program that was presented this morning to the discussions that resulted in three days of work - we will probably not even know the truth when it is presented to us because we have for so long wondered if it would ever be given to us. But the truth is that the work that you do - that the truth that you know is important even if there are varying ideas, even if there is a dissention of agreement. The truth that you know is that you care. His death was not an act of anger. It was a premeditated murder of our nation's leader. Motivated for very specific reasons and benefiting those that ordered it. The people of this nation know that. And they still hope for answers. They are a trusting lot, and we are part of that group. I believe, as my sister first stated to me a few years ago, that our belief system was destroyed in front of our eyes. We must take it back and the one thing you can believe in is yourself. Jack's death never took us away from us. It only took him away. It took away the role of a government that most of you were raised to trust. Your responsibility was to be citizens who met the criteria of citizenship: decent, caring, honest. The type of people grew up in this room where doors were unlocked, and Jack's death was more of a death knell to that lifestyle then even to his own life. That is why the symptoms and the syndromes of this country have suffered under may indeed be healed by the work that you do, and that healing process will involve open discussions, displays of emotions which are thought of as natural, not unnatural. There should be emotion in life. Without it we are cardboard and two-dimensional. The remembrances that we share, such as those that can be found on Web sites throughout the Internet, including those of our friend Cheryl Overland, JFK Lancer, and the chat rooms for college students that can express their emotions about a man that did not even live during their life time. They encourage and encompass the honesty of discussion which was a delight to a man who became President. And it is one of my saddest reflections on his life - that his death has taken some of that from this country. If the final analysis, it will depend on us for only we will decide what JFK death's meant to each of us. We will never probably know that absolute truth. But I hope - and perhaps that is the message I bring you tonight - that hope is still a possibility. Since that day 34 years ago, that event robbed us of what might have been. And I feel strongly that that fact - more than anything else - is what haunts us: What might have been. In the educators and the students that are honored tonight, JFK would have been delighted to be associated in both Bruce and Amy, and all of the finalists. We find that cooperation of roles between educator and student. Both of tonight recipients represent the best and they possess a desire to continue to teach and a continuing effort to learn. In the speech that my cousin was to deliver in the Trade Mart, many people mention the fact that he was to talk about the defense of this nation. But he began the speech, although not ever able to deliver it, with the words that told us that education and learning are the tools to the greatest defense of any nation. In Amy and Bruce, in the honor that they have presented, we are still recognizing those thoughts from 34 years ago. In Jacks' life, he came to depend on a bright mind for often his body was not his friend. In the years that he lay in bed, sick with fevers and injuries and diseases, he was always aware that his body may fail him. But his active bright mind and his curiosity was his greatest ally. In that in spirit I challenge those that you honor tonight to continue to inspire others to appreciate bright minds. In the years spent with that illness and pain, Jack Kennedy challenged himself to learn, to read to comprehend. The research committee here tonight shows to me that same determination. You must overcome obstacles, and you must trust that the learning you share is appreciated. As we examine John Kennedy, we can not see the man he was without understanding that he was multi-faceted. And in the authors who now says that he was a wart hog in his personal behavior - they have never slept in a bed that Jack Kennedy slept in which sounds like this [Kerry twice raps the wooden podium soundly]. He slept on a piece of wood. To have him be the worlds greatest Lothario would have been a miracle - ladies and gentlemen. This is a man who not only never slept a whole night's sleep, if any of you in the out their in the room thinks that sound is particularly good to love making you are mistaken. He would be delighted to be thought of as the Errol Flynn of his era. And then he would have been angry, because it takes away from what he truly accomplished. Did he like the ladies? Yes. Did he find bright, fascinating people a challenge and a delight? Yes. Would many of you in this room, possibility, have been a friend? I think so. He would have, liked that many of you are published. All of you are considerate. And most of you are egotistical enough to match my cousin. As am I. The Jack Kennedy that I want you to leave with tonight is not the man whose eyes showed the fright that day 34 years ago. He was bright. He knew what was happening to them. He knew he would be gone. You can look at the Zapruder film or anything else you want and look for his blue eyes that tells you in his reaction that he knew it was over. And to those who say he led a life filled with illusion, remember the words of his wife as he died: "Jack, I love you." 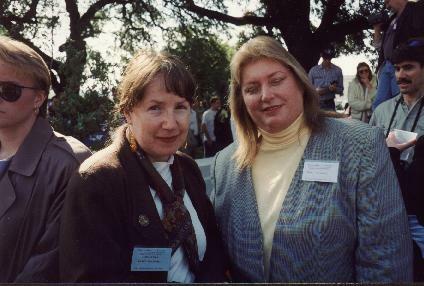 My wife, Karen Bradford, and Kerry McCarthy in front of Zapruder's perch, 11/22/97.